Containing our unique APS formulation, BRYT Calm Serum is rich in essential oils including Mimosa, Jasmine and Rose Absolute, plus skin-balancing active botanical ingredients including Watercress and Nettle, and moisturising Kalahari Oil. Skin is balanced and the natural equilibrium rediscovered. Cruelty-free. 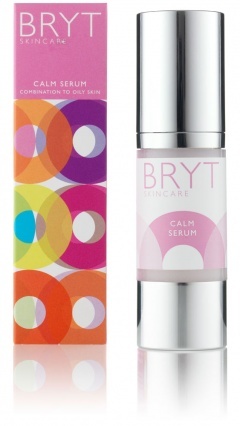 Rich in oils and skin balancing active ingredients which penetrate deep down to cell level, BRYT Calm helps regulate and normalise the skin, helping it rediscover its natural equilibrium. In addition to our antioxidant-rich APS formulation, BRYT Calm contains a unique botanical blend of Watercress, Nettle and Horseradish which work to regulate the skin's sebum levels. Kalahari Oil, taken from both the plant itself (which is known for its outstanding moisturising abilities) and from the seed, is rich in linoleic acid, an Omega 6 that helps renew and regenerate cells, while treating and nourishing the skin. Essential oils of Mimosa and Jasmine intertwined with Sandalwood and Rose Absolute nurture the many layers of skin, leaving it calm and supple with a sense of wellbeing. After cleansing, apply 1-2 pumps of BRYT Calm to your finger tips. Gently tap into the face and neck, firstly by following the hairline down to the eyebrows, then back to the temple, continuing along the cheekbone to the base of the nose. Continue up below the cheekbone then down to the chin, along the jawline to the earlobes. With the remainder, massage into the neck in upwards strokes from base of neck to chin. Allow to soak in for a few seconds before applying either BRYT Day or BRYT Night (STEP 3). Yet another wonderful serum from BRYT. I have bought one for all my god daughters, nieces, sons and friends . It is good as a primer - a handy serum. Absolutely love the calm serum. Works amazingly and the packaging is wonderful. I LOVE IT. I USE IT EVERY DAY. PERFECT FOR ME.